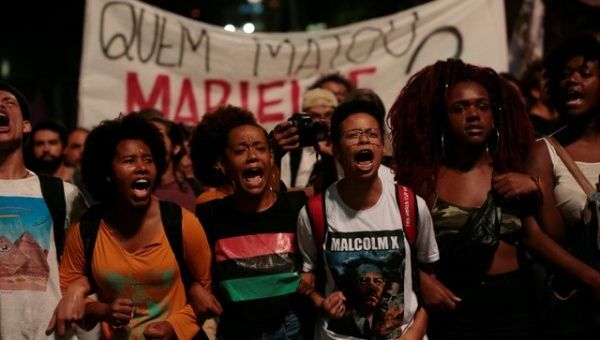 Brazil has been rocked this past week over the political assassination of Marielle Franco, a prominent Black, feminist and socialist activist in Rio de Janeiro. Franco was also an elected councilor in the Municipal Chamber of Rio de Janeiro and having grown up in a favela neighborhood, the dense informal settlements of the poor and often marginalized that surround major cities in Brazil, she was seen as a prominent organizer and voice against the poverty and police violence directed against the largely Black residents. We conducted this interview with our Brazilian comrades with the Rio de Janerio based political organization Federação Anarquista do Rio de Janeiro (Anarchist Federation of Rio de Janeiro or FARJ), which is a member of a alliance of similar organizations across Brazil, the Coordenação Anarquista Brasileira (Brazilian Anarchist Coordination or CAB). We discuss Marielle Franco’s legacy, Black struggles in Brazil, and the political context of her assassination. BRRN: Can you tell us about Marielle Franco, her activism, and what she was known for? FARJ: Marielle was a council woman of Rio de Janeiro, a member of PSOL (Socialism and Freedom Party), a party that was created as a split from the Workers Party (PT). She was elected in 2016 as the fifth most voted for councilor of the Rio de Janeiro municipality. However, first and foremost, she was a Black lesbian woman, born and raised in one of the biggest favelas of Rio, who had a long time story of rooted militancy and struggle. She was highly involved in human rights struggles, mainly around women’s rights (specifically abortion rights and against sexual violence) and Black struggles (against police brutality and black genocide). More recently, she was named the rapporteur of the Intervention Commission of the Municipal Councilor of Rio created to follow up the federal intervention in the security of Rio de Janeiro. In her last days, she was actively taking part in the denunciation of police brutality in Favela de Acari, a favela that has been a target of violent police operations, often resulting in fatal victims, and for months before the military intervention. She was very respected among Rio de Janeiro’s militants, even by the ones that don’t believe in electoral strategies, due to her story and combative practice. BRRN: Tell us about the political context of her assassination. We understand that the military and federal government intervened and took over policing in Rio de Janeiro last month. Marielle was from a favela neighborhood and a vocal critic of the military’s involvement in policing. FARJ: Rio de Janeiro has a long story of military intervention after the end of the Military Regime (1964-1985) since the 90s, especially in favelas. However, these interventions became more common after 2007, during the second PT government with Lula de Silva and during Dilma Rousseff’s two administrations. In 2008, the Pacification Policy Units (UPP) project started to be implemented in several favelas of Rio. The objective was to occupy the favelas with police, expel drug traffickers and, according to them, bring along social improvements to the neighborhoods. However, this never happened and since the beginning the only thing that occurred was many reports of human rights infringements, people being murdered, disappearances, houses being invaded and occupied by the police force, while drug trafficking continued to take place, but on the down-low. The UPP project was a clear preparation for receiving future big events, like the Olympics and the World Cup. During these events, military forces were used in favelas to transmit a sense of security to the population and tourists, while favela dwellers, formed mostly of Black people, kept suffering and dying. Rio went through other federal-military interventions, always focusing on operations in different favelas and this long-term intervention has not been different. Military forces occupied different favelas, are filing dwellers (by taking pictures of their ID and their faces) and several reports of human rights infringements had been made. Only in January of 2018, 66 people were murdered in Rio during police operations, almost all of them in favelas. The excuse of the “war on drugs” have been used for a long time as a blank check for the police forces to kill and jail black people in Brazil. 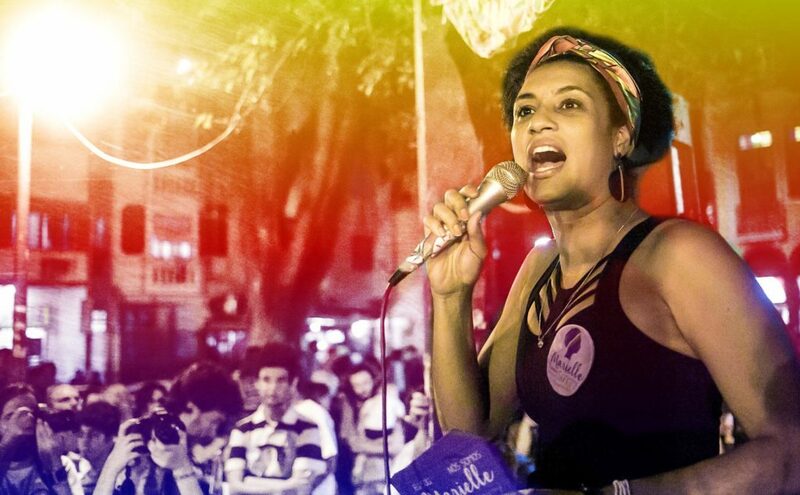 Marielle has always been an opponent of the militarization of city and acted firmly against police brutality in favelas and the periphery of Rio. Recently she has been denouncing cops from the 41st Police Unit, which conducts operations in Favela de Acari and is the most lethal police unit in Rio. Only in 2016, cops from this police unit killed 117 people. The killing of Marielle is a clear response to her actuation against the Black people genocide and being a Black woman herself, she was, as usual, the chosen target. BRRN: The media is reporting street protests in response to the assassination. What has been the response so far both from the government, in the streets and from social movements? FARJ: So far there has been huge demonstrations all over the country for two days straight and there are several others already planned. Marielle was a member of a political organization, member and supporter of social movements and previously worked for several NGOs. So, very quickly a network of support was formed and demonstrations were organized, but they have been more mourning rallies than anything, protests to ask for the end of the military intervention and for investigation of the incident. For us, Marielle’s murder has strong involvement of the police and is directly related to her denunciations of police brutality. The government, along with corporate media, is trying to use the case as one more excuse for military intervention, as her case there was nothing to do with it in the first place. The investigation has already revealed that the bullets used to kill her were from a batch sold for the federal police and which was already used in other crimes by the police like the slaughter of 18 people in São Paulo three years ago. BRRN: One aspect of Marielle’s political work that has been highlighted was her rising prominence as a Black activist and her criticism of the historic and embedded racism in Brazil which is rooted in anti-Blackness. For those in the US who may not be familiar can you briefly talk to us about what Black movements and struggles look like in Brazil today? And can you also discuss some of the influence in Brazil of US based civil rights and Black Power movements as well? FARJ: Here in Brazil, the Black movement are very connected to favela movements, as favela’s dwellers are mostly Black. So groups and collectives from favelas, even if they are not completely formed by Black people, have connections to struggles for Black people’s rights. Today we can see a few different kinds of groups that are active in favelas. Most favelas have a strong presence of NGOs and most of them are very limited in their objectives as they are funded by international capitalist organizations and are formed by professional activists. Also, there are several autonomous and independent groups that make community work in favelas focusing in police brutality and Black genocide. They work with families of victims of police brutality, with children, cultural activities and popular education helping people to get into college. There is still not a prominent Black national movement as Black Lives Matter there, but there are several groups and connections are being made. Black people in Brazil have a long history of resistance, from the quilombos during the period of slavery from riots in the favelas when someone is killed by the police. US based movements and figures are certainly an inspiration for the organizations here, but Brazil’s historical formation have very strong differences from the US and things can’t be simply transported. Although in general the problems Black people suffer here are pretty similar to the ones there, there are lots of singularities that make organization different. For example, in 2016 in the US there were 913 (2.8 people per one million inhabitants) people murdered by the police while in Brazil there was 4200 (20.2 people per one million inhabitants). So, Black movements here in Brazil have a strong history of organizing long term struggles as everyday there are people dying, innocent people being jailed, and they must always react to something made by the state. BRRN: In Brazil there is currently an ascendant neo-liberal right-wing in power which deposed the social democratic Workers Party President Dilma Rousseff in a parliamentary coup of sorts in 2016. We also understand that for many on the left in Brazil the recent intervention by the army into policing is reminiscent of the dictatorship that lasted over 20 years until 1985. FARJ recently wrote a piece analyzing the role of the intervention of the military in policing and the current political situation in the country (“A intervenção federal no Rio de Janeiro e o xadrez da classe dominante” or “The Federal Intervention in Rio de Janeiro and the Chess of the Ruling Class”). Can you briefly summarize your analysis there and whether you think Marielle’s assassination and the outrage it has generated may change the balance of forces? FARJ: In recent months, we saw unified actions from the government and corporate media to pass to the population a feeling or narrative that violence rates (assaults, stealing, general crimes) have been increasing with massive news during all day about assaults, especially during Carnival, when we have a lot of people and tourists in the streets. This excuse lead to the implementation of the federal/military intervention which started about a month ago and, initially, is scheduled to last until the end of the year. We don’t have any doubts that the intervention is a method of social control and that the main target, as always happens, is Black and poor people. The capitalist white supremacist state will use any tools they have to ensure that their neo-liberal plan will move along without problems. The intervention means a false sense of security for the middle and ruling class at the cost of more death, suffering and loss of the few rights that Black and poor people have in this country. Rio de Janeiro has always been a laboratory for the rest of the country, as we saw with UPP project which has been implemented in other states and with the recent neo-liberal reforms on public services. The intervention here is a clear test on whether it can be used in other places around the country. 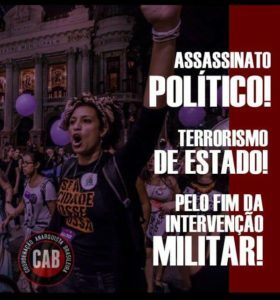 Also, the murder of Marielle seems to be a clear message to social movements because of it’s clear connection with the state ‘paramilitary’ forces. It means an increase in the level of political repression and, although it’s not something exclusive of current Temer administration, it is certainly connected to it. The killing of militants and social movement leaders is a consolidated practice in Brazil and is very common reality outside of the big cities with peasants and indigenous movements. In 2017, 65 people were killed and 4 massacres were registered and in 2016 there were 61 killed. 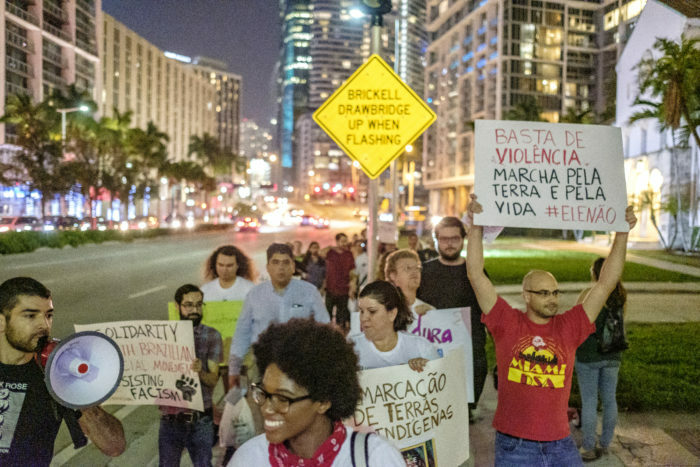 The work of collecting this data by different organizations, including the work conducted by Marielle, is very important because it helps social movements and people not only to have someone who claims attention and denounce all this violence, but also to give legal/juridical support. We do expect that the murder of Marielle can generate something bigger and massive, but its still soon to say what will happen. 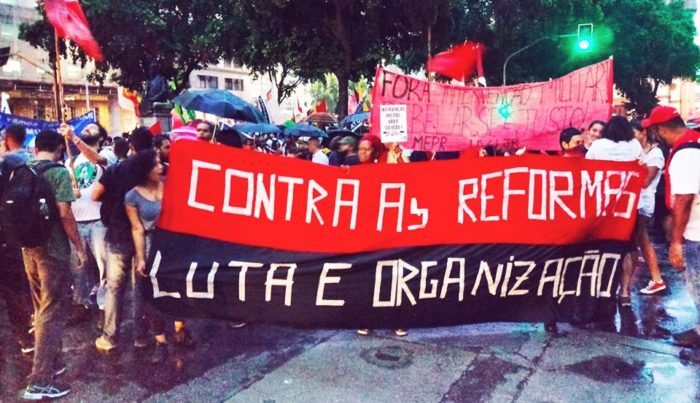 However, it is extremely necessary that anti-racist and anti-capitalist groups, social movements and left political organizations answer this attack by organizing, mobilizing and taking the streets with combative direct actions, to fight back against the crimes committed by capitalism and the state on the body of the marginalized sectors of Brazilian population. 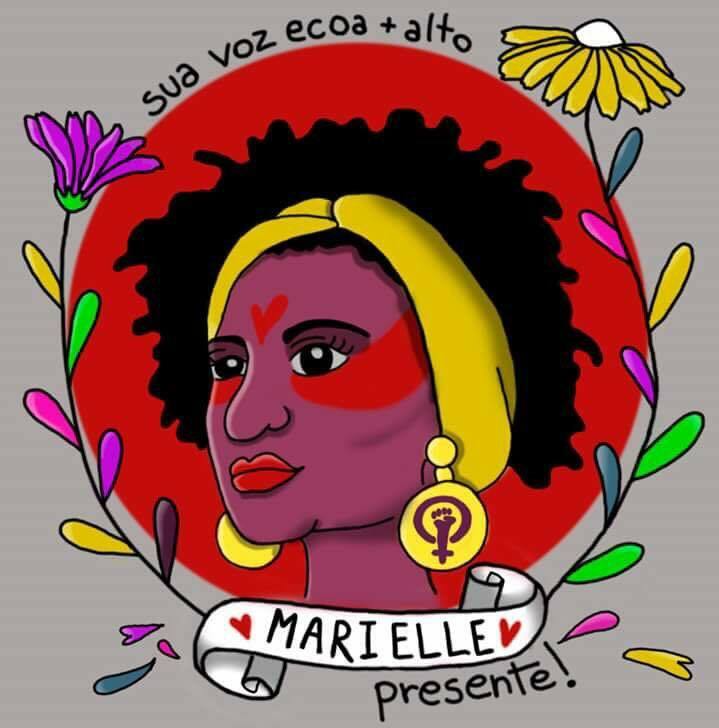 We also recommend taking a look at a solidarity statement on the assassination of Marielle Frano from the CAB “Marielle Franco, Presente! – Political Murder and State Terrorism in Brazil.” Other articles related to Brazil are “Domingo Passos – The Brazilian Bakunin” a short, biographical piece on the renowned Black Brazilian anarchist Domingo Passos; an article on the struggle and strike of municipal workers; and the theoretical piece “For a Theory of Strategy” by the CAB.